With the snow melting and the rain coming down, be aware of flooding Saturday. 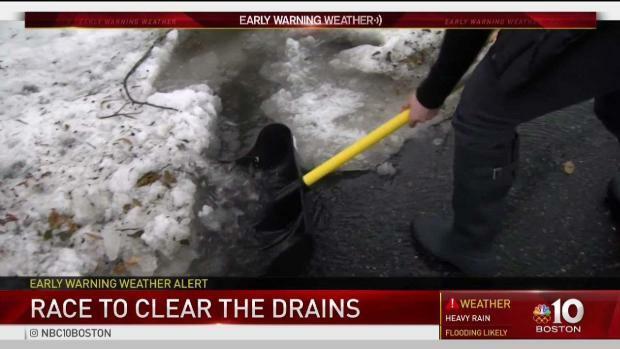 A combination of heavy rain and warm temperatures melted plenty of snow in New England, and with many storm drains still blocked by snow and ice, we are seeing localized flooding Saturday in and outside of Boston. Torrential downpours Friday night generated three inches or more of rainfall in some areas. Motorists are reminded to not drive through flooded streets, and the Massachusetts Department of Transportation (MassDOT) is cautioning drivers who plan to travel Saturday. Parts of the MetroWest in Massachusetts are already experiencing problems from Friday's rain, with more to come. MassDOT reports that Memorial Drive westbound at the Longfellow Bridge is closed due to flooding in Cambridge. In Brookline, where water has pooled on sidewalks and flooded the road, a lot of drivers were opting to take side streets. While bigger trucks seemed to be getting through the flooding on Boylston just fine, some cars got halfway through before turning around. Elsewhere in Massachusetts, West Bridgewater fire officials are asking motorists to avoid Howard Street and Spring Street near the Spring Street School as multiple electrical poles are down, blocking the roadways. Crews are on scene in Tewksbury where the exit 39 off ramp from I-495 south to Route 133 (Andover Street) is closed due to flooding. Hanover police are reminding residents that a combination of heavy wind and a significant amount of rain can cause old rotted trees to fall after crews responded to a fallen tree in the road. 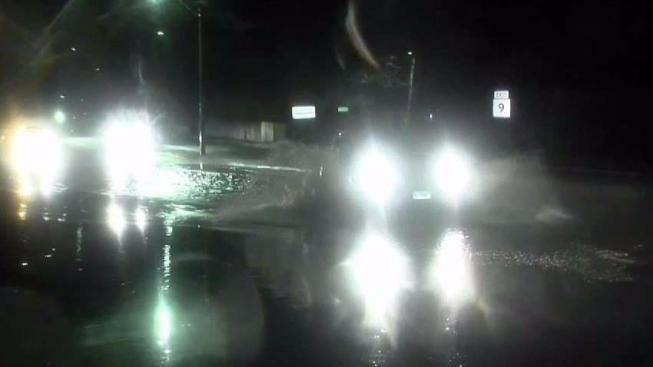 State officials in Connecticut are warning residents to be aware of possible flooding and pools of water over highway lanes and roadways. 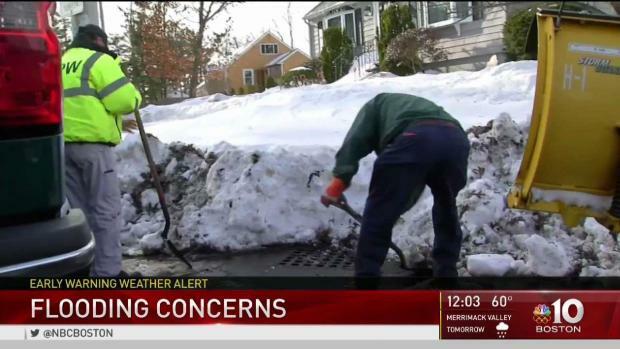 You'll still find large piles of snow despite the recent warm days. They'll be whittled down in size once the rain starts, but that will contribute to rising waters. Connecticut state police reported Route 8 southbound at exits 22-20 in Seymour is open following flooding in the left lane. In Rhode Island, flooding blocked all travel lanes on Hope Street at Washington Street in Bristol. It has since been cleared. New Hampshire is also experiencing localized flooding. In Jefferson, Route 115A is closed. Peterborough town officials are advising drivers to seek alternate routes after closing Route 202 at Sand Hill Road, Summer Street and Sharon Road. Red Cross volunteers are mobilized throughout New Hampshire and Vermont, working with local emergency management while rivers rise to flood stage. There is one evacuation center opening at 10 a.m. in Swanton, Vermont, at the Missisquoi Valley Union High School. The Red Cross is also monitoring rivers with ice jams that may result in flooding for communities including Otter Creek in Rutland, VT, Winooski River downstream from Montpelier, VT, Souhegan River in Milford, NH, Saco River in Conway, NH, Pemigewasset River in Woodstock, NH and Plymouth, NH, Sugar River in West Claremont, NH, Contoocook River in Peterborough, NH where traffic is being re-routed due to flooding, and Connecticut River in Strataford, NH. 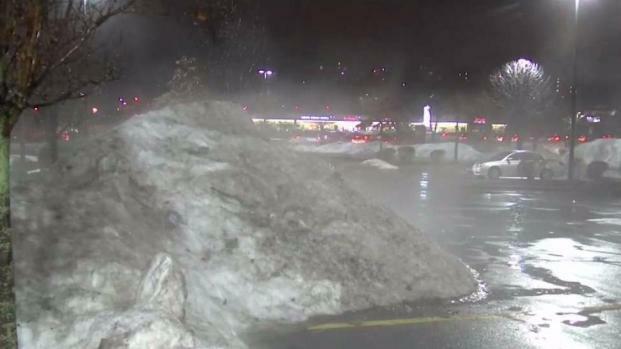 You'll still find large piles of snow despite the recent warm days. They'll be whittled down in size once the rain starts, but that will likely cause flooding for some. Most of the river flooding is in northern and western New England as of early Saturday morning. There is moderate flooding of the Winooski River in Vermont, and minor flooding of Pemigewasset River in New Hampshire, Missisquoi River in Vermont, Hoosic River in western Massachusetts, and the Connecticut River. Ice jams and some evacuations are ongoing in Swanton (Missisquoi River) and Johnson (Lamoille River), Vermont. The Orange fire department is reporting precautionary evacuations are underway for parts of Athol, Massachusetts. An ice jam appears to have formed, blocking the river. Flows will remain high throughout the day and cold weather may freeze more jams. Authorities remind anyone who lives near a river to monitor and leave if water approaches. In addition to flooding and ice jams, a flash freeze is a concern Saturday. MassDOT roadside message boards are warning of that as temperatures are expected to drop to below freezing throughout the day. This significant drop in temperature can cause a quick freeze of any standing water, making travel very hazardous. With the heavy rain Friday into Saturday, road salt was washed away. MassDOT crews have been treating road surfaces in the areas where rain has stopped and plan to continue to do so until the threat of icing has passed, but drivers are still asked to proceed with caution. In northern New England, travel will also be hazardous where there are winter storm warnings in effect due to the rapid change from rain to freezing rain and snow. A winter storm warning means significant amounts of snow, sleet and ice are occurring. • Clear snow and ice from all windows and lights, even the hood and roof, before driving, (start with the tailpipe). 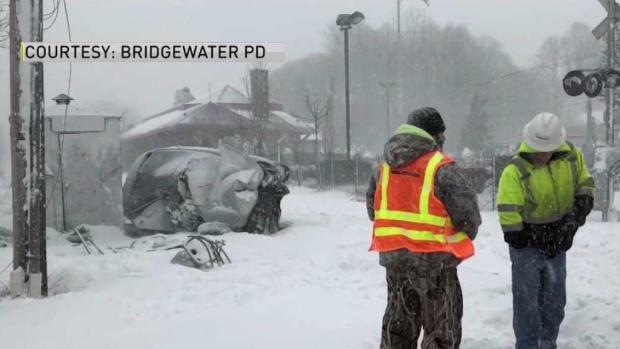 An elderly couple was stuck on train tracks in Bridgewater, Massachusetts, during Thursday's storm, but Ryan Saba and Raymond Armstead rescued them. • Remember that the posted speed limits are for dry pavement. • Use brakes carefully. Brake early. Brake correctly. It takes more time and distance to stop in adverse conditions. • Bridge decks freeze first. Due to the difference in the exposure to air, the surface condition can be worse on a bridge than on the approach road. • Exit ramps are an even greater challenge during the winter since they may have received less anti-icing material than the main line. • Leave room for maintenance vehicles and plows – stay back at least 200 feet and don’t pass on the right. • Seat belts should be worn at all times – it’s the law. • Most importantly please remember to slow down. MassDOT highway districts had been preparing for several days for heavy rain and cold temperatures, anticipating flooding and icing on road surfaces. Crews cleaned drainage areas of debris and further pushed back snow piles from the shoulders of roads.